Coffee Table. In Ambrosia Maple and Walnut, with breadboard ends. Small bowls in Maple and Walnut. Hand carved wooden spoon in Walnut. 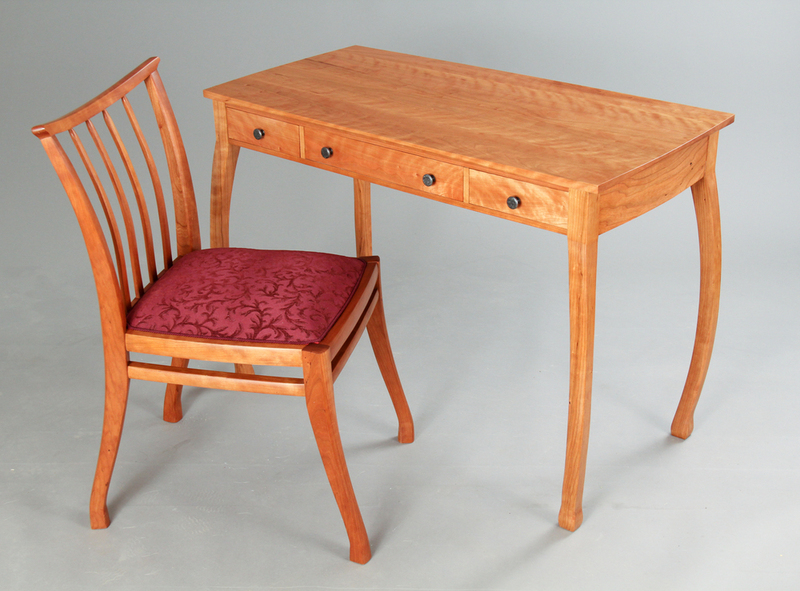 All by David Lewis, journeyman furniture maker with the Guild of Vermont Furniture Makers. The first step to making custom skis was learning the finer points of working with wood. His parents advised him to try a woodworking class to see if he enjoyed it. Naturally, he was drawn back to Vermont, his childhood vacation spot, and the Vermont Woodworking School. He began with their introductory class, just to see how he felt. It was then that furniture making became not just a means to an end, but an end unto itself. The piece that probably singularly convinced Lewis that furniture making was his real passion was the first chair he had ever made at school. It demanded complex joinery and hand shaping, challenging the limits of his burgeoning skill. He realized that the personal growth he achieved from furniture making was something he wanted to continue to pursue. Lewis’s enjoyment of making diverse styles shows through in his work, and may continue. Maybe, ultimately, that will be his “style” — working on everything. As the newest journeyman member of the Guild, we can’t wait to see what David Lewis creates next. This entry was posted in In the Studio on August 19, 2016 by Guild of Vermont Furniture Makers. Love your creations. Couple of questions if I may. Did you assemble the maple top and then cut a single tenon across both ends? With a table saw? Did you use a router for the mortise in the breadboard ends? Did you wedge the dowels by making them slightly off center? Thanks.